Posted in: ATP, Portugal Open, WTA, Zoo Tennis. Tagged: 2014, atp, Carla Suarez Navarro, Carlos Berlocq, champion, Portugal Open, recap, review, tennis, tomas berdych, wta. The Women’s Champion of the 2014 Portugal Open is Carla Suarez Navarro after a titanic battle on center court, which saw her come back from 4-1 down in the decider to beat Svetlana Kuznetsova 6-4 in the third set to win her first ever career title and go up to #14 in the WTA rankings. It turned out to be one of the best finals of the event since it started in 1998. On the men’s side, Tomas Berdych dispatched Victor Hanescu with the expected ease, overpowering him from the very first game on his way to a 6-2 6-2 win. His opponent in the last match of the tournament will be Carlos Berlocq, who after a very tight first set against Gimeno-Traver where he won 8-6 in the tiebreak and comfortably won 6-2 in the second set to reach his 3rd career final. On paper, everything points to another comfortable Berdych win in the final. He’s superior to Berlocq in every aspect of the game. They have played three times with Berdych winning all of them in quite routine fashion and the Czech has much more experience in matches like this one. It’d be a considerable surprise if Berdych wasn’t the one hoisting the trophy at the end of the match, picking up some steam for the battles ahead in the clay Masters and Roland Garros. Posted in: ATP, Portugal Open, WTA. Tagged: 2014, atp, Carla Suarez Navarro, Gaston Elias, oeiras, Portugal Open, recap, tomas berdych, wta. The final Saturday of the Portugal Open will feature the women’s final and the men’s semifinals, all on center court. The day will open with Svetlana Kuznetsova facing the #1 of the tournament Carla Suarez Navarro in the final. Kuznetsova is far past her best days, but has played a very good week in Portugal, showing why she is a former Roland Garros champion (2009). Her game has proved too powerful and solid for the field so far on the slow Oeiras clay. Still, it’d be perhaps fair to claim she will enter the final as the slight underdog – albeit one with good chances – against Carla Suarez Navarro, one of the best clay courters and a player who’s often praised and got the Portuguese crowd on her side due to her beautiful technique and game. The head to head is 3-1 for the Russian, but the only time they met on clay was back in 2008, when Suarez Navarro was still young and not established as a top player. In any case, it should be a great final to conclude another very good Portugal Open edition on the women’s side. On the men’s side, the #1 seed Tomas Berdych survived a very good performance from Mayer to book a spot in the semifinals, even from a break down in the deciding set. His opponent will be Victor Hanescu, who beat the last Portuguese player standing in Gastão Elias. On paper, Berdych is the overwhelming favorite to reach the final since when both play at their usual level the Czech does pretty much everything better than Hanescu, with better technique, more power and more consistency. It’ll take a strong performance from Hanescu and a less than stellar one by Berdych for any other outcome other than Berdych playing the final on Sunday. The Czech should be very eager to win his 10th ATP level title, as well as to gain some momentum ahead of Madrid, Rome and Roland Garros, tournaments where he aims to perform well and maybe even win. The other semifinal might look weak on paper, but both Carlos Berlocq and Daniel Gimeno-Traver have been playing great tennis this week and haven’t even dropped a set on their way, although they’ve done it mostly on the outside courts in matches that were not broadcast on TV/stream. Yesterday, Berlocq secured his first ever win over a top 10 player in Milos Raonic, with one of his best ever performances, dominating Raonic from the baseline and doing a more than decent job returning his booming serve. Making an ATP final is not a chance that comes around every day for a player of Berlocq’s level/ranking, especially when the semifinal is against a player he has a positive H2H of 4-1 against, so it’s doubtful that he will be satisfied with simply recording his first ever top 10 scalp knowing that a chance (albeit small, with Berdych still in the draw) for a second ATP title in Bastaad last year is there. Gimeno-Traver also played amazingly yesterday, easily disposing of his countryman Marcel Granollers 6-1 6-2 on Centralito, firing winners of both wings at will, even off his usually unreliable backhand. If he can sustain that level, you have to imagine that there’s not much Berlocq can do despite the H2H. Despite his inconsistency, when in form, Gimeno-Traver has a very big serve and one of the best forehands on tour, capable of hitting winners from anywhere in the court. On paper, he also stands a better chance in a potential final with Berdych due to having a higher peak level of play. All that said, this is a very unusual matchup for an ATP level semifinal. Berlocq has merely reached two finals in his career (won one), while Gimeno-Traver has never reached an ATP level final – both players are bound to be both excited and nervous before this unique opportunity, which might affect the quality of play. Posted in: ATP, Portugal Open, WTA. 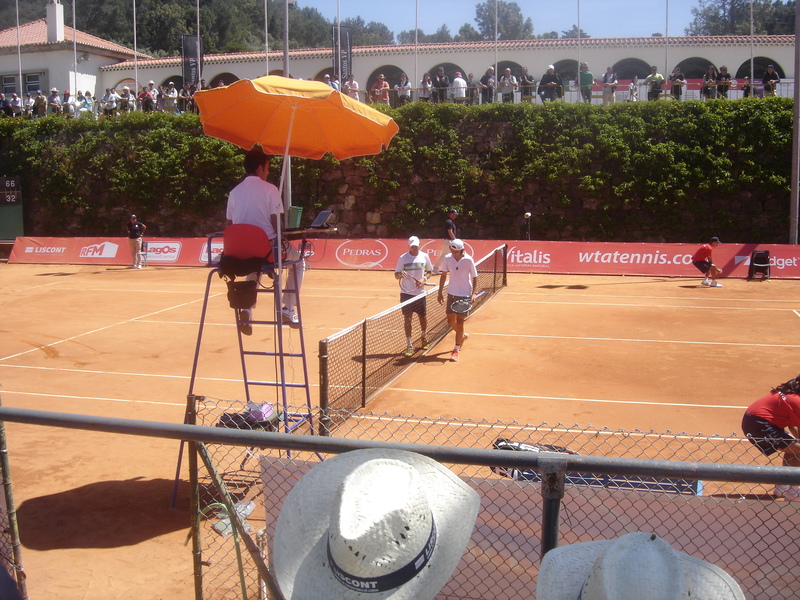 Tagged: 2014, atp, Gaston Elias, oeiras, Portugal Open, Quarterfinal, recap, tennis, wta. As always, May 1st was by far the best attended day of the week of the Portugal Open, it being a public holiday in Portugal. Centralito was probably as full as its ever been, enough to encourage Gastão Elias to sensationally upset recent Casablanca winner and Monte Carlo quarterfinalist Guillermo Garcia-Lopez 6-4 3-6 6-2. By his own admission, Elias played one of his best ever matches to repeat his Portugal Open quarterfinal performance of last year. His quarterfinal opponent will be Victor Hanescu, who defeat Pablo Carreno Busta in 3 tight sets. While the Romanian is the favorite, he’s not exactly an unbeatable opponent for Gastão, who will definitely fancy his chances to reach his first ATP semifinal if he keeps his level up from yesterday. Tomas Berdych and Milos Raonic made their Portugal Open 2014 debuts and they won their respective matches with unsurprising ease, both with the same score: 6-3 6-2 without getting broken. The Canadian didn’t even face a single break point. As is the case with most opponents, Pablo Cuevas never really found an effective way to return Raonic’s massive serve. Berdych will face Leonardo Mayer in the quarterfinals, after the Argentinian played yet another solid match to defeat Golubev 6-1 7-6. Mayer caused Berdych quite a lot of problems in the only time they met, last year at the Davis Cup, but the Czech is still a very strong favorite to progress. 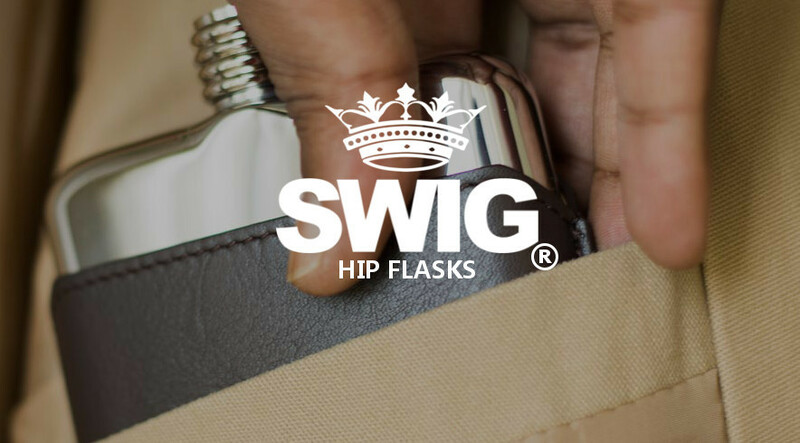 Raonic, on the other hand, is taking on Berlocq – who expectedly beat Lukas Kubot with relative comfort – in yet another match where his serve was simply too overwhelming for his opponent. The final and perhaps least interesting of the men’s quarterfinal had already been decided on Tuesday, with Daniel Gimeno-Traver facing Marcel Granollers, the latter being the favorite though few would be shocked if Gimeno-Traver came out with the win. Should logic prevail though, the semifinals will surely feature Berdych and Raonic, against one of Elias/Hanescu and Granollers/Gimeno-Traver respectively. On the women’s side, Carla Suarez Navarro barely broke a sweat to defeat Polona Hercog 6-1 6-3, and the same can be said for Svetlana Kuznetsova’s surprisingly easy win over Eugenie Bouchard. While the Canadian might be the future, at the moment the 2009 Roland Garros winner just has too much skill and craft on a clay court for Bouchard to handle. Kuznestova will now face Elena Vesnina in the semis. Vesnina is bound to be tired after playing the best match of this year’s women’s event in the quarters – a back and forth grueling match that saw her eliminate Roberta Vinci 7-6 4-6 7-5 in almost 3 hours. Kuznetsova looks in better shape to reach Saturday’s final. Suarez Navarro is overwhelmingly favored to be there as well as her opponent, Irina Camelia-Begu. ICB was the winner of an improbable quarterfinal clash between qualifiers. Posted in: ATP, Portugal Open, WTA. Tagged: 2014, atp, day 3, estoril, oeiras, portugal, Portugal Open, preview, recap, spain, tennis, wta. Day 3 at the Portugal Open saw the conclusion of the women’s round of 16 and only three men’s matches. Due to Gastão Elias’s final in a Brazilian challenger last week, his first round matchup with Volandri was postponed until yesterday afternoon. Despite all the tennis he has played lately though, Gastão looked quite sharp in this match and had break points in all but one of Volandri’s service games (where he still got to deuce). He was aggressive all match long and got it done 6-4 6-3 despite some of his usual choking in some points, including an excruciatingly long and possibly deciding game at 4*-3 in the second set. In order to repeat his quarterfinal performance from last year, Elias will now have to beat #4 seed Guilhermo Garcia Lopez on the same stage Frederico Gil did in 2010 during his dream run: the Centralito. Garcia-Lopez is the obvious favorite, but Gastão is showing some good form and he will have nothing to lose so an upset might potentially be in the cards if the factors align. The second round of matches started yesterday, with Granollers prevailing over Montanes in a very tight 3-setter, where the 2009/2010 champion had a lot of opportunities to close things out but ended up missing another opportunity to go deep again at the Portugal Open. The other player already through to the quarterfinals is another Spaniard, Daniel Gimeno-Traver, who beat Rui Machado 6-3 7-6. DGT’s serve and forehand were more often than not too much for Machado to handle; by the time he seemed to finally adapt to Gimeno-Traver’s game somewhat it was already too late to do something in the match, although he was relatively close to taking the second set and forcing a third set. Round 2 of the men’s draw will be concluded today; Berdych is the massive favorite to triumph over Devvarman at Center Court for obvious reasons and he should really win. Berdych has made a habit of shocking losses vs far inferior players, but Devvarman on clay is hardly a threat at all. Berdych won their only matchup 3 & 1 on a Harcourt on Chennai. Raonic should have more trouble against the talented but frequently injured and inconsistent Pablo Cuevas, but his serve and power should grant him a relatively safe passage to the quarterfinals. On court 1, Victor Hanescu and Andrey Golubev will lock horns in the first match of the day; the names might not sound too appealing, but both can play incredible tennis on clay when inspired and could produce a very nice spectacle if they’re on their day. Finally, Golubev and Mayer will face each other in a match that will be everything bar a classical clay-court match. Mayer is the favorite to outhit Golubev and reach the QFs on this surface, but with two players like these, consistency isn’t really something to be taken into account. It will all depend on what level they show on the day as both are capable of breathtaking hitting performances but equally of absolute shockers when they’re off. If you’re a betting man, you should really stay away from this match! On the women’s side, only two of the seeds are missing the quarterfinals. Samantha Stosur and Lucie Safarova – defeated today in 3 sets by Polona Hercog in a match filled with unforced errors and poor serving throughout – and Kaia Kanepi – shockingly sent packing by the Romanian Begu. In the other matches of the day, logic prevailed with the #1 seed even delivering a double bagel to her opponent. The quarterfinals promise to be really interesting, especially the first one and only on center court that will fit the seasoned veteran Kuznetsova to Canadian upstart Eugenie Bouchard. Can the Canadian make another breakthrough or will the Old Guard prevail even while not at their best? Suarez Navarro and Vinci are also clear favorites over Polona Hercog and Elena Vesnina, although both are playing pretty well so far and have a shot at going even further on current form. Finally, what should be on paper the tightest match of the round will be played on Court 2 and pit Timea Bacsinszky against Irina-Camelia Begu. The Romanian maybe emerges as an ever so slight favorite, but the match should be great and well contested throughout. Posted in: ATP, Portugal Open, WTA. Tagged: 2014, atp, oeiras, Portugal Open, preview, tennis, wta. On the men’s side, this was a day of some surprising results, none more so than Rui Machado double-bagelling Dmitry Tursunov; while the Portuguese played a great match, Tursunov never really looked engaged and his movement and footwork were awful throughout. He only won 18 points in the entire match in what is surely one of the most bizarre matches we’ve ever seen. The other Portuguese player in action on Center Court wasn’t so lucky, as Leonardo Mayer turned up to play and beat João Sousa 3-6 6-1 6-2 in a match where the Portuguese #1 definitely seemed to feel the pressure of playing before his home crowd. After winning the first set, he basically imploded and never really found his game again, allowing Mayer very comfortable wins in the following two sets. The final match on center court also saw a big upset with Lukas Kubot snapping his losing streak to beat Teymuraz Gabashvili 6-3 7-5. The Russian was undone by his inability to convert break points (0/4) and couldn’t really follow up his excellent Barcelona run. On the outer courts, experience beat youth on two occasions, with 30+ yo Carlos Berlocq and Daniel Gimeno-Traver beating young upstarts Taro Daniel and Alejandro Gonzalez respectively. Taro Daniel will be especially disappointed with his poor play on every big point, as well as the weaknesses shown in his forward movement – Berlocq basically won the point every time he used a drop shot, regardless of its actual quality. In the Romanian duel, Hanescu ended up prevailing in a very scrappy 3-setter where he (Hanescu) seemed down and out more than a few times but benefited from his countryman’s inability to step up in the biggest points. Yet another instance of experience beating youth was Albert Montanes, the tournament’s 2009 and 2010 winner, beating Carballes Baena 7-6 6-3. In the least interesting (on paper) and attended matches of the day, Somdev Devvarman easily prevailed over Matthew Ebden and Pablo Cuevas barely made it past Aleksandr Nevodyesov in a very tight 3-setter. Today, Granollers and Montanes will face in a presumably extremely tight R3 match, while the Machado and Elias will take on Gimeno-Travor and Volandri respectively. Given form and ability, it’d be fair to say Machado has a great chance to make the quarterfinals. That’s all when it comes to men’s matches being played tomorrow. On the women’s side, #1 and #2 seeds entered the tournament with a bang by dispatching their lower ranked opponents without any problems. The rest of the results were also normal, with the higher ranked/better players showing their supremacy on the tennis courts compared to ‘mere mortals’. The only exception was Samantha Stosur, who ‘pulled a Tursunov’ and got demolished by Timea Bacsinszky 6-4 6-0. Bouchard is up again, this time vs Yaroslava Shevdova – a potentially tricky opponent if she’s on a good day. Bouchard is still working towards her first career title. The rest of the seeds also didn’t have to do very much for their managerial stock to rise and most are unlikely to win against tomorrow and make QFs again. The best match of the day will be between Kuznetsova and Toro-Flor. Posted in: ATP, Portugal Open, WTA. Tagged: 2014, atp, Day 1, oeiras, Portugal Open, predictions, preview, recap, tennis, wta. Today at the Portugal Open, the qualifying tournament was concluded and the main draw started for both the men and the women. On the men’s side, after the top 8 seeds made the final round, the top 4 seeds advanced to the main draw. Leonardo Mayer will face Portuguese João Sousa today, Daniel Gimeno-Traver has been drawn against Colombian youngster Alejandro Gonzalez, Radu Albot will face yet another countryman in Victor Hanescu, and Taro Daniel will face Carlos Berlocq for a place in the second round of the Open. Overall, you could say it’s been a pretty kind draw for the qualifiers and all of them have chances to progress further. On the women’s side, Alla Kudrayatseva advanced to face the #1 seed Carla Suarez Navarro, Irina-Camelia Begu has been drawn against the Japanese Kurumi Nara, Timea Bacsinszky will face the #3 seed Samantha Stosur and Kristina Mladenovic will face the 8 seed Elena Vesnina. As far as main draw action is concerned, the favorites prevailed on the men’s side, albeit not without some hiccups. Andrey Golubev and Adrian Mannarino played a very poor match, with unforced errors flying off both players’ rackets at an alarming rate and both players tightening up on key points. Eventually, the favorite prevailed in a match that the 10-20 people who were in the stands will surely not remember fondly. In the other ATP main draw match of the day, Pablo Carreno Busta seemed to be heading to a routine win when he served for the match at 6-1, 5-2 against a very erratic Mikhail Kukshkin, but things nearly went South as the Kazakh managed to take a set to a tiebreaker with a lot of help from PCB. In the end though, last year’s semifinalist superior consistency prevailed for a 6-1 7-6 victory. On the women’s side, Magdalena Rybarikova won a tight first set against Lucie Safarova only to bizarrely proceed to totally implode and get double bageled for a 6-4, 0-6, 0-6 defeat. Yaroslava Shvedova prevailed in relatively comfortable fashion against Karin Knapp as expected, 6-2, 6-4, while the less successful Radwanska sister fought hard but couldn’t avoid a 10th consecutive defeat at WTA level, this time against Yanina Wickmayer. Home support wasn’t enough to spur Maria João Koehler to an improbable upset as she was routined 6-1, 6-3 by Ons Jabeur. Finally, in the tightest and most interesting match of the day, Bojana Jovanoski prevailed over Monica Puig 6-4, 4-6, 6-4 in a match that lasted almost two and a half hours. Tomorrow, two Portuguese male players will be in action on center court. Rui Machado takes on Dmitry Tursunov, and while the Russian is the obvious favorite, an upset isn’t totally off the cards considering Tursunov’s recent form, which includes a defeat to Inigo Cervantes – a player who was ranked outside the top 500 – in Barcelona. João Sousa, on the other hand, Portugal’s greatest ever player, will start as the favorite against qualifier Leonardo Mayer, but only slightly. Despite their respective rankings, it is clear that Mayer has the better weapons at his disposal and if he is on a good day, Sousa’s participation in his home tournament might be short-lived. Sousa’s own form isn’t encouraging, with consecutive clay losses to Carballes Baena, Fabio Fognini and Marinko Matosevic. He will need all the support he can get from the Portuguese crowd to get through this very tricky first round. The final match on center court between Teymuraz Gabashvili and Lukas Kubot really shouldn’t be much of a contest considering the players’ respective forms and ability to play on clay. Anything other than Gabashvili in 2 sets would be a considerable surprise. On the secondary courts, some very interesting men’s matches are scheduled. 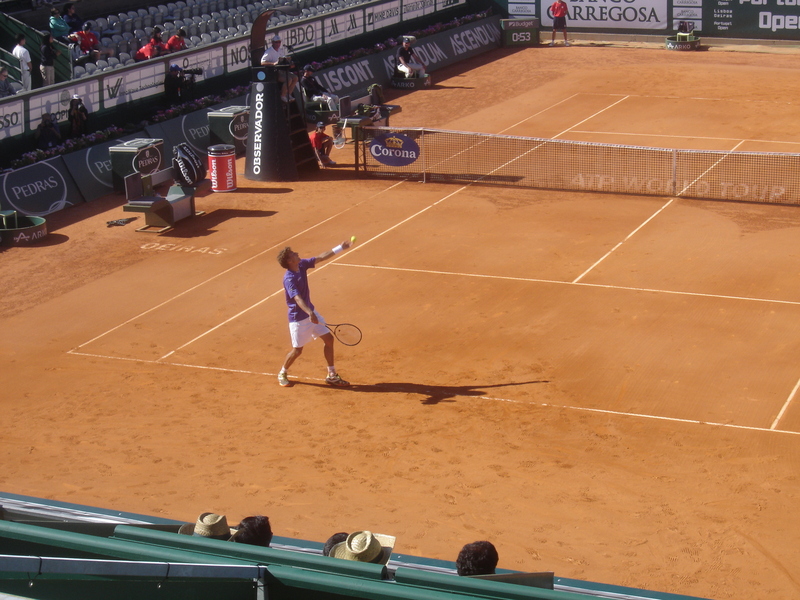 Last week’s Barcelona finalist Santiago Giraldo will be looking to keep his momentum going against the 2009 and 2010 Portugal Open champion Albert Montanes – always a tough foe on clay and especially at the Portugal Open. Form suggests Giraldo, as does the 4-1 H2H in favor of the Colombian (2-1 on clay), but how often have we seen players not being able to follow up a great week? For Giraldo, reaching the final in Barcelona was the highest point of his career so far and it remains to be seen whether he can back it up. On court 1, Aleksandr Nedovyesov will face Pablo Cuevas – who, while lower ranked, is the vastly superior player on this surface and emerges as the favorite to progress to the second round. Carlos Berlocq and Taro Daniel will open up the day on court 2. On paper, Berlocq is the favorite, but Daniel has been making fantastic progress so far this season, especially on clay, and this might be another opportunity to make a breakthrough. A solid clay court player like Berlocq is far from an unwinnable proposition for the 21-year-old Japanese. Another match that’s very hard to call between a clay court veteran and a youngster is the one that opposes Daniel Gimeno-Traver to Alejandro Gonzalez; Gonzalez has played some excellent tennis at times this season though, more so than Gimeno-Traver, and this might be another opportunity to make a decent run and keep rising through the ATP rankings. On court 3, arguably the most uninteresting match of the day will pit Matthew Ebden against Somdev Devvarman, two players who are reknowned for their lack of powerful weapons from the baseline and who are at their worst on clay. 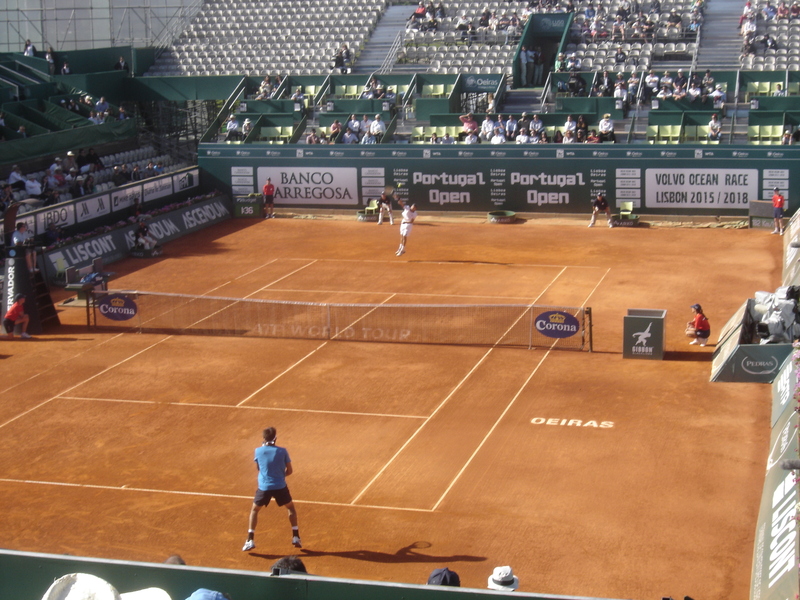 While the match is expected to be competitive, people attending the Portugal Open hoping to watch quality clay court tennis will almost surely be better served looking elsewhere. Finally on court 4, Victor Hanescu will face Radu Albot in an all-Romanian matchup, with Hanescu the overwhelming favorite to book a round 2 date with Pablo Carreno Busta. On the women’s side, the tournament’s top wild card, Eugenie Bouchard, will get center court honors against Alisa Kleybanova. Unfortunately for the Russian, the fact that her surname sounds like clay hasn’t really helped her develop an effective game on the surface and she shouldn’t pose too much of a threat to the #2 seed. On court 1, seeds Roberta Vinci, Samantha Stosur and Carla Suarez Navarro are overwhelming favorites to advance as the latter two drew qualifiers while Vinci’s opponent Alexandra Cadantu from Romania is ranked well outside the top 50. Kaia Kanepi and Svetlana Kuznetsova enjoy a similar edge over their opponents, Yvonne Meusburger and Shuai Zhang, and the same for Elena Vesnina against qualifier Kristina Mladenovic. The tightest match of the day on the women’s side on paper will be contested on court 2 between Barbara Zahlavova-Strycova and Romina Oprandi; Zahlavova-Strycova has won both of their past meetings, but they’ve both been close 3-setters and neither on clay. On court 3, Polona Hercog is expected to defeat Stefanie Voegele without much difficulty, while Shuai Peng could very well encounter some problems against Spanish clay specialist Maria-Teresa Torro-Flor. Finally on court 4, Kurumi Nara and Irina-Camelia Begu will contest a match that seems like it could go either way. Slight advantage to the Romanian, who feels more comfortable on a clay court despite being the inferior player overall. Posted in: ATP, Estoril, Oeiras, Portugal Open, WTA. Tagged: 2014, atp, Day 1, oeiras, open, portugal, preview, wta. The beginning of the 25th edition of the Portugal Open is upon us. In the first day, none of the tournament’s top seeds will be in action, but there will still some notable main draw play, with two men’s and four women’s first round matches. The rest of the day is dedicated to the conclusion of the qualifying tournament. All top 8 seeds have made it to the final round. #1 seed Leonardo Mayer, this year’s Vina del Mar finalist, will face recent Casablanca semifinalist Carballes Baena for a place in the main draw in what seems to be the best match of the lot. Gimeno Traver is a solid favorite to make it past Desein, as is Albot in the all-Romanian clash against Crivoi. Finally, the rising Japanese youngster Taro Daniel will face Jordi Samper-Montana in his quest for another ATP main draw appearance after an excellent quarterfinal run in Vina del Mar, where he only lost to Almagro. In the men’s side of the main draw, Adrian Mannarino and Andrey Golubev will kick off the proceedings. The Frenchman has struggled all year and clay is his weakest surface, so the relatively in-form Golubev is easily the favorite to proceed after a good run last week in Barcelona. That run was only halted by eventual champion Kei Nishikori. They have never played in the ATP tour, but logic suggests a relatively straightforward win for Golubev. The winner will face Portuguese #1 João Sousa in round 2. The other men’s match of the day will pit last year’s semifinalist, Pablo Carreno Busta, against another Kazakh player, Mikhail Kukushkin. This is also another first-time matchup at the ATP level. The Spaniard is more comfortable on the surface and has the slight edge going into this match, but Kukushkin has the bigger weapons and on a good day he can easily win this match, as Andrey Kuznetsov did last year in Barcelona against the same Carreno Busta. On paper, this seems the most interesting of the two men’s matches of the day, with Kukushkin power going up against Carreno Busta’s consistency. On the women’s side, the day will start with Yanina Wickmayer and Monica Puig facing each other, also for the first time. Although the two players are ranked very close to each other, Puig emerges as a considerable favorite since her game translates better to clay courts. Next on Centralito, Portuguese wildcard Maria João Koehler will face Ons Jabeur, also for the first time. Despite being younger, Jabeur is clearly the better player at this point in their respective careers as the rankings show. Home-court advantage could help the Portuguese cause an upset if she’s on a good day. 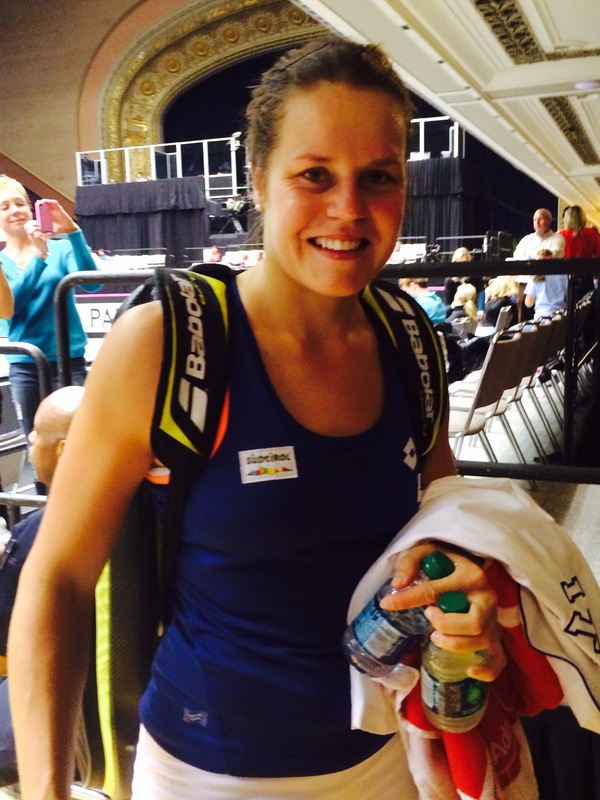 On court 1, Yaroslava Shevdova will face Karin Knapp for the third time. Knapp won their two previous meetings on hardcourt, but on clay Shevdova should have the edge, although her extreme inconsistency makes this match pretty much a toss-up. Finally, on Center Court, the best paper match of the women’s opener will pit Lucie Safarova against Magdalena Rybarikova. Safarova appears to be the favorite, but she has lost two of their three career meetings, including the only one they played on clay. She might very well be upset early in Portugal.